I an trying to run a CCTV 5mp camera from the end of my long driveway to my DVR. Using RG59 18/2 awg 700' 12v dc. I get some voltage drop when IR LEDs turn on at night and makes the camera turn off. I don't have a power source anywhere near the camera so of course I'm having issues. I also have some video distortion "horizontal scrolling lines". I was wondering what I can do to make it work. I'm thinking about running RG6 or RG11 to help with the video distortion But what can I do to get power at the right voltage to the camera? Start at 24 volts (or more) and make a 12 volt regulator near the camera. To determine whether or not your primary supply voltage is high enough, take a meter to your regulator and check the input voltage while the camera is running. And while this advice is simple and straightforward, I'm perfectly aware that actually doing it may be a challenge. While the regulator itself may be as simple as a single TO220 part (plus a couple of capacitors), you'll need to make a housing for it which is both weather-tight and insect-proof, which may well test your abilities. I'm thinking about running RG6 or RG11 to help with the video distortion But what can I do to get power at the right voltage to the camera? While you describe your problem in two parts, it's really a combined problem. Your current configuration has signal/power splitters at both ends and you feed 12VDC from an external adapter into your splitter. The splitter you have is a passive (it contains only) inductors and caps. Note: It's highly likely that at the power level of your camera (related to the current flowing through the cable) one of the inductors is saturating, and this may well be cause of your signal distortion. You don't describe your camera at all, but you may already be in trouble there. I have a high res security camera, and it is 12W @12V so draws very close to 1A when the IR LEDs are on. Many cameras are lower power, perhaps in the 6-8W range, but this can still require close to 700mA at 12V at the camera end. It's important that you find the data on your camera and ascertain the actual power/current used by the device. You already have your RG59 cable in place and it will be expensive ($200++) to replace so that I'd suggest you need an active power over COAX system that uses a much higher voltage at the supply end to reduce the current as much as possible on your COAX cable. RG59 (most variants use a steel/copper clad center wire) is not really suitable for long runs of power over coax. To overcome the problem you need to increase the input voltage as much as possible to reduce the current requirements. 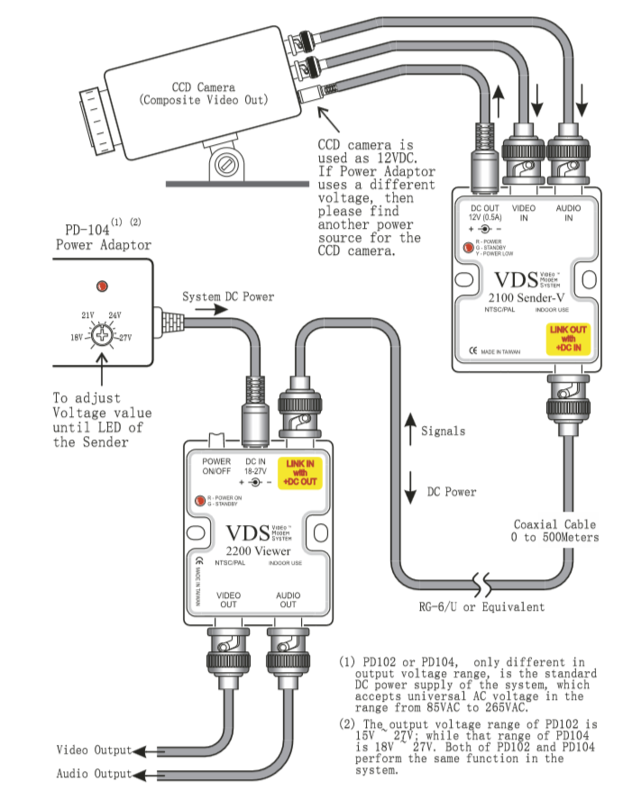 One potential solution as an example id the VDS 2100/2200 splitter (I've used these) which uses up to 27VDC input and provides a small SMPS to supply the 12V at the camera end (the VDS2200). This will certainly work for a 6-8W camera, but may not work for above that. Note here that they recommend RG59 would be unsuitable for even a 6W load at 400ft, but that RG6 would be suitable out to 750ft. This VDS POC solution might just be able to provide you a fix at 27V input using RG59 if your camera is less than 7W. Replacing the RG59 with RG6 will NOT fix your power problem, while putting a high voltage POC solution in place might fix both your problems without replacing the RG59. You need to move to an active POC system with much higher input DC voltages. There are POC's with up to 70VDC input voltage available (try a security supplier). If you can't get the current on the RG59 down significantly with a POC system, then you may have to replace the RG59. Update: For those technically inclined, the voltage drop across the center conductor (though higher) is rarely a problem for the camera signal. The voltage drop over the outer conductor is however extremely critical. Voltage drops of only 500mV here directly subtract from the video signal (which is capacitively coupled on to the center conductor) at the DVR input. This can cause loss of sync and various other video side effects. Us of a linear regulator on the camera end means the current required by the camera is reflected in BOTH the center and outer conductor. For a 6W camera (500mA @12V) with 700ft of RG59 this would mean about a 3.5V drop across the center conductor and about 1.5V across the outer conductor. This 1.5V ground potential could easily upset the DVR input. 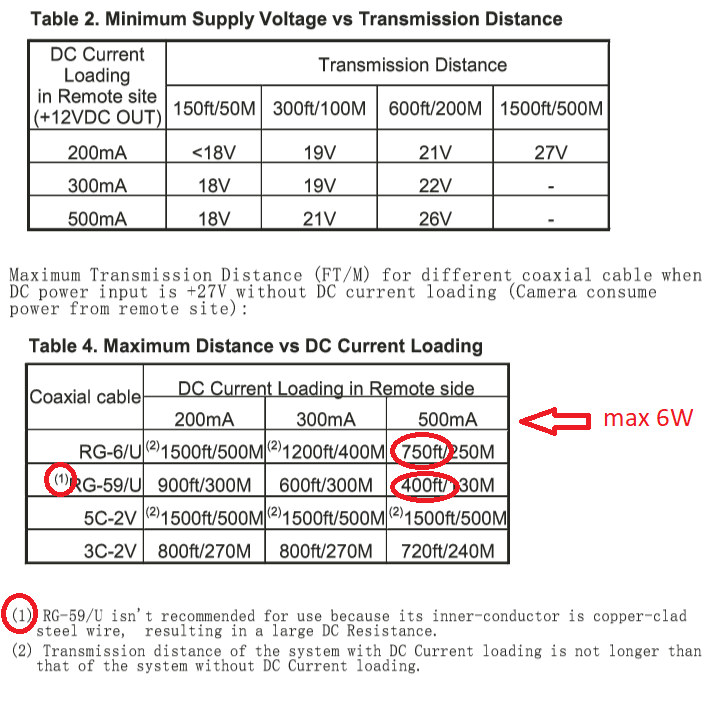 To keep the ground offset low (<500mV) using the RG59 would require a maximum current of about 170mA at the high voltage supply. If the camera is 500mA ...then this means the high voltage supply needs to be in the order of 36V. This is why in my original comments (now deleted) I suggested both a high voltage supply of 36-48V AND ensuring an SMPS was used at the camera end. It seems you need about 19~20V with a good 12V LDO at camera end for this lossy installation. What I do in this situation is choose a universal laptop charger which is >=65W @19.x V and often adjustable in 1V steps. It would be possible to modify the universal charger with the 4pin adapters used for remote voltage feedback and different plug types using the video conductor for DC feedback. I have done before , but it is more involved with details as it has an LM317 like interface. The scrolling vertical bar is usually the 59.x video frame rate with 60 Hz current noise ingress when the scan rate is very slow due to difference frequency. The video quality also degrades due to group delay distortion of a long lossy cable. I would recommend a Ch2,3 modulator with enough signal level often found in old VCR’s , maybe adding a 12dB booster to avoid the line frequency noise & distortion and put the signal up in 60MHz band with at least 100uV . Using an Alum. Case will protect any exposed components and act as a heatsink. e.g. Hammond type case with lid and perhaps test point for measuring end voltage. Not the answer you're looking for? Browse other questions tagged power dc or ask your own question. What should I use for powering a Raspberry Pi at near space altitudes? Can I use a 11.1V LiPo directly on 12V electronics? How can I detect which DC power source to send to an underwater camera housing? Parallel DC Conductors - Need Multiple Grounds?